We provide complete website packages including design, hosting, and IDX integration. Fully Customizable - Unique Design! Click to see a side-by-side comparison chart. Do you already have a website and just want to integrate MLS data? Our IDX Integration allows you to add listing searches, featured listings, listing reports (by criteria), contact forms, and more. to an existing website by setting up a RETS feed with your MLS. Sarts at $24.95/mo. + $99 setup fee. Have a client you want to impress? 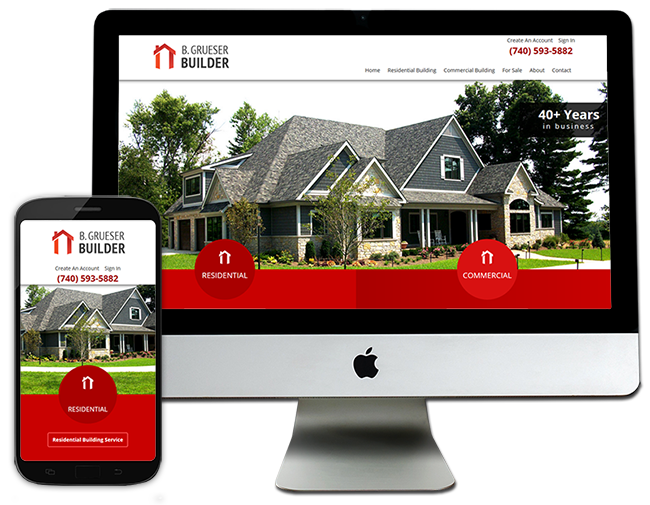 Get a dedicated property website to showcase its features and attract buyers. Property websites provide "value added service" and set you apart from your competition. Each site comes with a FREE RealtyTours.com virtual tour! Starts at $9.95/mo. + $249 setup fee. Are you a managing broker or owner that wants to provide a website to all your agents? If so, Office-Plus might be just what you are looking for. We can provide each of your agents a template based, full-featured website at a discounted price! Each site includes: customizable bio, home page slides, photo, contact information, IDX integration and featured listings for each agent. Are you looking to really target a specific area, development, community or subdivision? If so, an Area-Plus website could help you gain targeted clients. These websites focus on specific keywords and unique content about the area that helps you build a niche market and attract prospects doing internet searches for the specific area. Starts at $9.95/mo. + $249 setup fee. The heart of our Design-Plus and Custom-Pro websites is IDX integration. This means we will connect your website with your MLS association using a RETS feed to provide listing information directly on your website. Information is updated hourly, so when a listing is added or updated in your MLS it will also be added or updated on your site automatically. This allows you to provide accurate, up-to-date information to your clients. There are many ways to present listing information including: custom searches, featured listings, preset searches, and open houses. What good is a website if it is not bringing you business? All our websites have the ability to add lead generating forms, commonly called "Contact Forms". These forms are customizable and can be used in a varity of ways to attract new clients. Additionally, our Design-Plus and Custom-Pro websites have the ability to enable customer accounts that let users save favorites and better communicate with you. You can optionally require users of your site to create an account before accessing certain pages, search results, and/or listing details. We build every website using the best known SEO practices and settings. This includes a mobile friendly resposonsive design, proper meta tags, robots.txt, sitemap, keywords, etc. Doing this will give your website the best chance at ranking higher in the search engines. Please keep in mind that no one can control where your site is ranked in organic search results. We do not provide additional services such as paid advertising and link exchaning but are happy to offer our recomendations. We use Google Analytics to collect and track visitor information on your website. Google Analytics is a robust program that can track how visitors get to your website, what keywords they used, how long they stay on your site and much more. Basic stats are available directly through your control panel and if desired you can easily add your own analytics code and access all of what Google Analytics offers. Each website provided by RealtyPro IDX, comes with its own in-house control panel and website editor. One of the biggest benefits of this is that we can upgrade at will and keep on top of the ever changing internet. We have our own experienced designers and developers that constantly work to keep everything on the latest standards. If you ever need help, you can rest assured that when you call, you will get a "real person" that is friendly and experienced. We pride ourselves in offering the best custom service. We offer live phone support and help Monday-Firday during normal business hours. We also have help and support built into the control panel. Once your website is complete, a staff member will teach you how to use the control panel and website editor to manage inquiries, accounts, blogs, and other ongoing tasks.